Boasting a brewing history older than the United States, Delaware packs an outsized punch in the craft beer scene with its landmark breweries and bold flavors. In 1873, the German lagers of Wilmington's Diamond State brewing rose to dominance. After Prohibition and the bust of the first craft beer bubble, entrepreneurial homebrewers resurrected the industry. Sam Calagione of Dogfish Head led the charge by rewriting the state's beer legislation, and the field opened to other brewpubs like Stewart's and Iron Hill to pair savory bites with their brews. 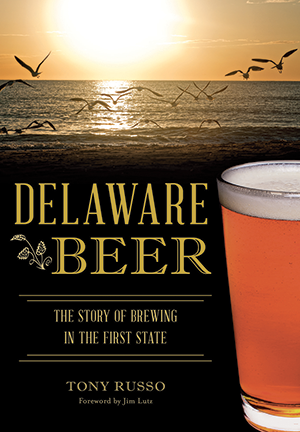 By 2009, production breweries like 16 Mile and Fordham & Dominion were on the rise, changing the arc of Delaware beer. Beer writer Tony Russo tells a story of big risks and innovative brewers and proves that there has never been a better time to drink local. Tony Russo has worked as a journalist since 2004, writing and editing for daily and weekly newspapers and magazines, and most recently as editor of OceanCity.com. Tony has written about beer almost since the start of the craft beer revolution in the region. He co-hosts a popular, weekly podcast “Beer with Strangers” and runs the ShoreCraftBeer.com craft beer lifestyle website. He lives in Delmar, Maryland, with his wife and four daughters.